Discussion in 'Broker Discussion' started by Andy, Mar 21, 2013. Official discussion thread for Forex Optimum Broker at Digital Cash Palace. Forex Optimum is a team of professionals, who gathered to unite the ideas and use the experience of the largest finance companies to create the broker of new generation with essentially new approach for work in the Forex market. Learning on experience of other broker companies and being guided by the needs of modern trader, we created hi-tech services with unique products. what about the commodities ,what else area you are dealing except forex? Our scope of business-forex. Maybe you have any specific questions? The Forex Optimum company cares about its customers. Therefore, the Management has decided to reduce the spreads on major currency pairs of Forex group. Available trading tools and spreads you can see on the contract specification page - «Currency». Please, pay attention to the amendment of the Trade Regulations and the partnership agreement, due to the changes in spreads. We are interested in providing a transparent and user-friendly environment for each trader. We will be happy to hear your suggestions for improving the quality of our services to supplement the new services. AXICO LEARNING CENTRE IN PARTNERSHIP WITH FOREX OPTIMUM BROKER INVITES TO A GREAT OPENING OF AXICO LEARNING CENTRE IN INDONESIA. Train Yourself and make your investments work for your wealth. Each participant gets free study material and 300-1000$ Bonus from Forex Optimum Broker. To take part in the even please leave comment to this post or message us. Hello dear forum's members and guests. Are pleased to announce that effective August 1 - 50% bonus for a deposit. Every time depositing your account you get bonus as much as 50% from the amount of your deposit. 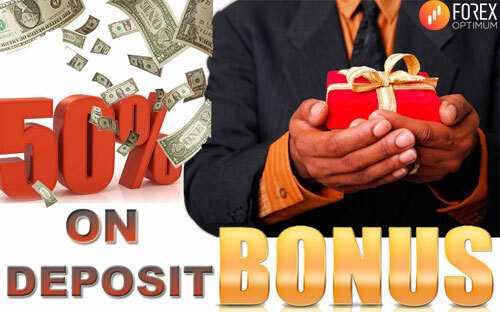 Bonus can shall credited for deposits from 100$ and more. The promotion is valid from August 1, 2013 - on November 1, 2013 to: Malaysia, India, Indonesia, Pakistan, Africa. The seminar will be held at: Grand sahid Djaya Hotel .. Jalan jenderal Sudirman kav 86 jakarta pusat. (Sebelah lee meridien n da vinci). Grand sahid Djaya Hotel .. Jalan jenderal Sudirman kav 86 jakarta pusat. (Sebelah lee meridien n da vinci). The seminar will be held at: Hotel Kartika Candra. Jln gatot subroto kav 18-21. Jakarta. Hotel Kartika Candra. Jln gatot subroto kav 18-21. Jakarta. Dear trader, we would like to pay your attention that since 1 August 2013 a maintenance of MetaTrader4 for PC of 500 build and earlier will be stopped. This restriction does not apply to the mobile version of the terminal. We recommend you to upgrade your MetaTrader4 trading terminals to 509 build on page «For trader» or using the automatic update option LiveUpdate in the trading terminal. Axico Learning Centre in cooperation with Forex Optimum broker held a free seminar «Being a Successful Investor» in Jakarta, Kartika Candra meeting room. 30 Investors had a chance to share their knowledge and experience with one of the successful traders from Russia - Alex Kiselev. Seminar program included presentations about secure investments, financial assets and a workshop on some trading technics from Alex Kiselev. This was a first step and a start of Axico Learning facilities for traders and investors starting it's way in Indonesia. We have learned some basic programs and will be glad to share much more in our future seminars and webinars. Forex Optimum and Axico are always glad to see you at our offices and would love to share our knowledge further in order to achieve good results for your assets in future. 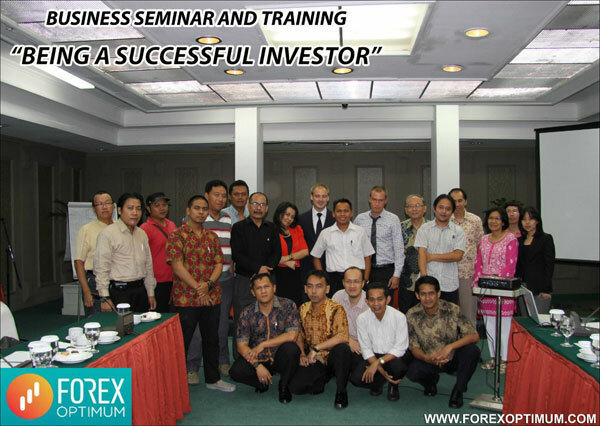 Everyone are welcome for free webinars coming soon for Indonesian traders. More technics, more strategies, more interesting people and tutors are expected to attend you soon. official representative in Indonesia at www.forexoptindo.com for the upcoming events. Forex Optimum and Axico want to say thanks to everyone who came to this event and wishes you success in your trading. We are pleased to announce the start of "The League of Robots" competition on September 1, 2013! Set your automated trading system on the competition and get the real cash prizes and bonuses from the Forex Optimum company. The results of the intermediate stages will be brought once a month, the first three positions will be awarded on every stage of the competition. The main results of the competition will be brought after each quarter of the competition (every 3 months). Show and prove that your system is better! Get involved and Good luck! We are glad to inform you that from today Forex Optimum launched an advanced publication of analytical review! Now you have more options to predict the movement of exchange rates on certain currency pairs, receiving fresh and timely analytical news to define your trade strategy for the desired period of time. Dear customers and forum members! Every Monday we will lay the interim results of the contest "The League of Robots" and you will be able to observe how the standings. We wish good luck to the participants of the contest! Prove that the system that you are using in your trading, better! Stay on top of world news and events with the Forex Optimum company! allow traders to predict and analyze the movement of exchange rates of currencies in the world! because it contradicts to the requirements of payment processing in our company. payment systems as PayOnline or Moneybookers. we decided not to limit the withdrawal to it in the near future. credited with the payment system Liqpay. 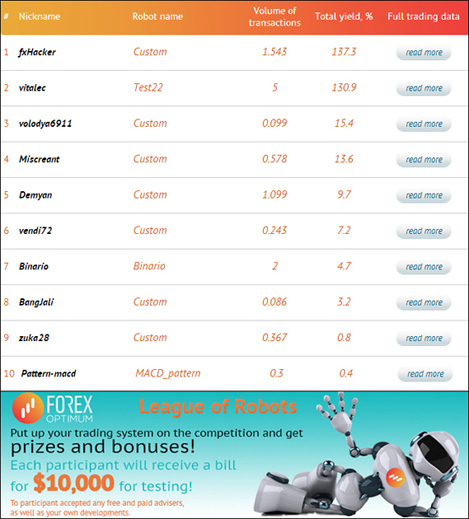 Forex Optimum pleased to announce their traders of the beginning of the second stage of contest « League of Robots». Do not miss the opportunity to demonstrate your robot and prove that you are the best on the Forex market! The conditions of the contest can be found on our website in the section «League of Robots». 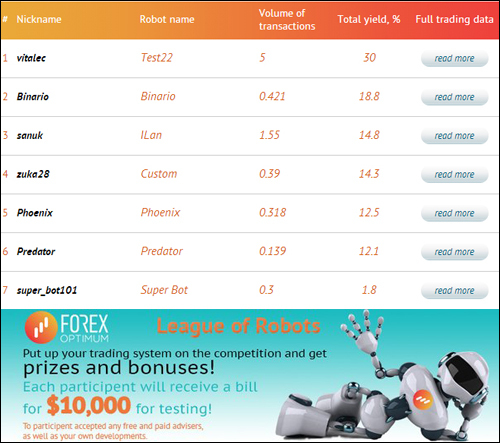 Forex Optimum pleased to announce their traders about beginning of the third stage of contest « League of Robots». Congratulations to the winners of the tournament "League of Robots" and wish them good luck!